TWENTY20 is a valued recruitment platform for young athletes heading to college. Many universities are now offering partial and full scholarships to capable female cyclists for their varsity programs. To compliment the university scholarships, TWENTY20 created the Ride 4 Education program. The "Ride 4 Education" program, co-founded by Barry Bonds, TWENTY20 General Manager Nicola Cranmer and Team Director Mari Holden was activated. The program offers scholarships to members of the TWENTY20 junior development program. 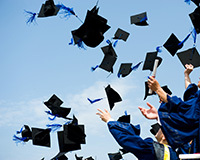 TWENTY20 has successfully developed junior athletes and connected them with colleges as they graduate from high school. TWENTY20 then enables these athletes to race with our development and professional programs while attending college and fulfilling collegiate academic and race obligations. The priority for our program is always academics allowing our athletes to obtain the best education possible for life after cycling. 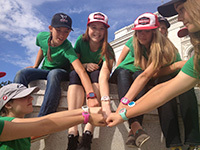 TWENTY20 Pro Cycling is the only professional team with an integrated junior program. Offering junior athletes an opportunity to race with our team not only helps them gain valuable race experience and a fast track into professional racing, but it also encourages them to apply the same skill sets of focus, endurance and discipline they display in cycling to their academics and the pursuit of an undergraduate college degree. Education, Athletics and Community are the three pillars of our program. Scholarships are currently limited to members of TWENTY20. Scholarships are awarded to full-time high school students ages 17 and 18 or first year college students. Our selection committee will be awarding scholarships to qualifying applicants to supplement their college tuition while continuing to pursue cycling. Having excellent academic grades, leadership qualities, community involvement as well as solid racing results and teamwork will determine eligibility of the TWENTY20 junior applicant. Contributors include The Barry Bonds Family Foundation, Will Chang, Biagi Brothers Inc, Rainey Miller, Dean Family Trust, Burns Family Foundation, Jackson Family Wines, Holden Family, Jeff Bernstein, David & Becky Vigil and Wendy Tonkin Philanthropic Fund. The Ride 4 Education Selection Committee is supported by: Margaret Hepworth, Dr. Kristin Wingfield, Jim and Terri Holden, Mari Holden and Nicola Cranmer.